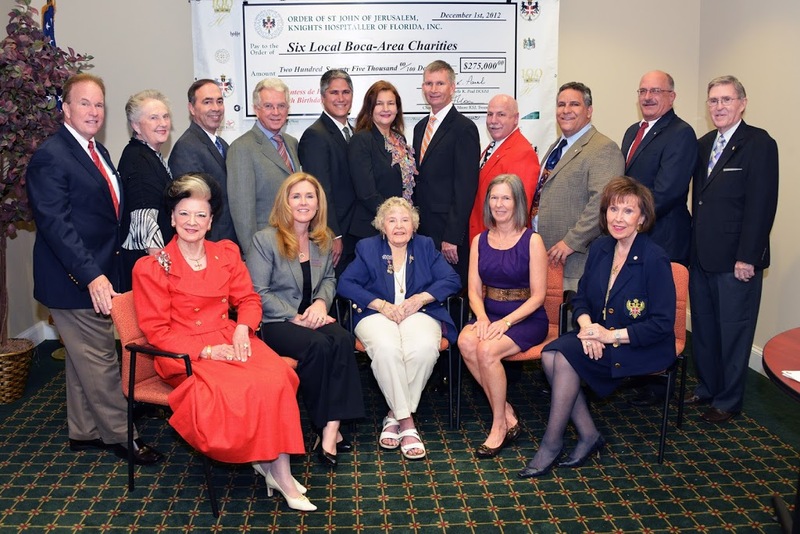 Boca Raton, FL (December 10, 2012) – The 23 Members of one of the world’s oldest Orders of Chivalry approved the distribution of $275,000 to six local charities just in time for the upcoming holiday season. The funds were raised mostly from a single event, the local philanthropist Countess de Hoernle’s 100th Birthday benefit gala held on September 24th. Boca Raton-based Order of St. John Commandery of Florida produced and presented the event. 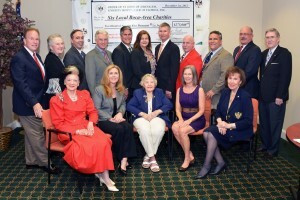 A revered member and patroness of the Order of St. John of Jerusalem, Knights Hospitaller, Dame Henrietta attended the meeting that awarded five life-changing charitable awards that averaged more than $40,000 each to Boca Helping Hands, Family Promise of South Palm Beach County, Gulfstream Goodwill Industries, Inc. Homeless Veterans Initiative, HomeSafe and Spirit of Giving Network. The OSJ Commandery of Florida’s holiday gift provides funding for: Boca Helping Hands’ “Blessings In A Backpack” weekend meals for children and cover the organization’s daily lunch program for one day each week for one year; Family Promise of South Palm Beach County’s Child Care Program; Gulfstream Goodwill’s “Project Success” and “Project Succeed” services for its clients, particularly residents living in Homeless Veteran’s Residential Housing; HomeSafe’s “Safety Net” program offering immediate intervention and prevention services to victims of domestic violence and their children and its “Life Skills” life management program; and Spirit of Giving Network’s pre-school medical screenings program as well as major support for its “Community Back to School Bash” that annually distributes backpacks, school supplies and clothing for school-age children of low income families. In a separate action, an additional $20,000 grant was made to FoundCare, Inc., located in West Palm Beach, to provide dental care for those without medical insurance and $5,000 to the OSJ’s New York and New Jersey Commanderies for distribution to relief agencies helping victims of Hurricane Sandy. Gala Chair and local Commandery leader, Commander Isabelle Paul DCGSJ, said “The mission of our 1,000-year old Order of St. John has always been to care for the sick and poor. Our sister in St. John, the Countess de Hoernle, is a model of local charitable giving and the celebration of her centenary resulted in what we believe to the largest gift produced from a single OSJ event—her 100th birthday,” she added. (Standing L to R) Greg Schultz (C100 Event CEO), Ellen Labrie (OSJFL Secretary), Michael Diamant (Board President, Family Promise of South Palm Beach County), Gary Peters (Board President, Boca Helping Hands), Matthew Ladika (CEO, HomeSafe), Karen Krumholtz (Executive Director, Spirit of Giving Network), Doug Paton (Board President, Spirit of Giving Network), Brian Edwards (VP Marketing & Development, Gulfstream Goodwill Industries), Marvin Tanck (CEO, Gulfstream Goodwill Industries), and James Labrie (OSJFL Philanthropy Committee Chair).